Structure CBD is a plant based health and wellness organization based in San Antonio, Texas. we are focused on promoting balance and vitality through the use of phytoCannabinoid products. 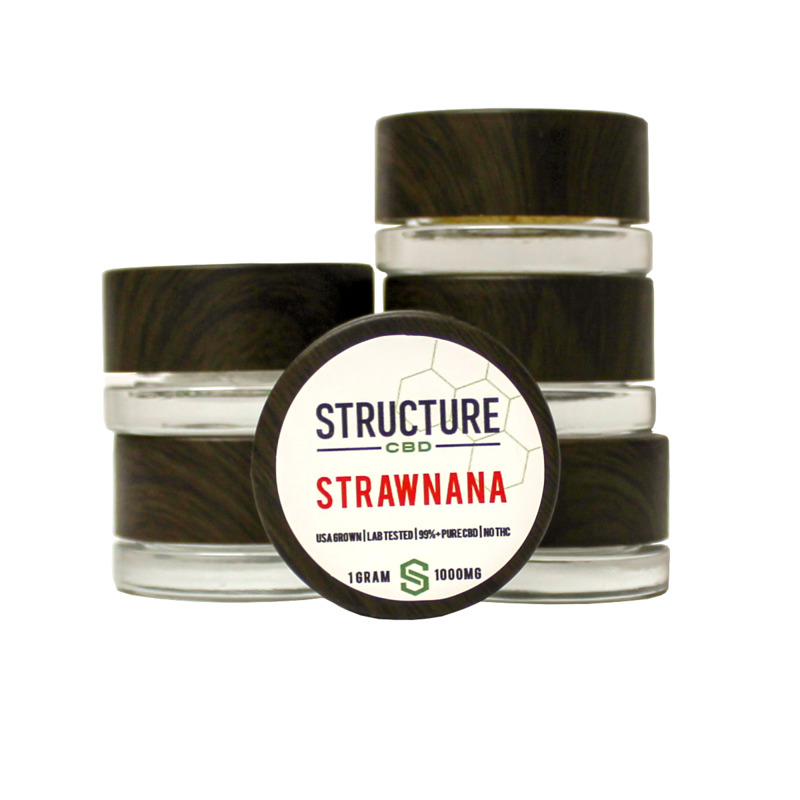 The Structure Dabs are all formulated using a combination of Structure Proprietary Terpene blends, as well as Terpene Profiles to achieve the best flavor and attributes available. Using 99.8% pure CBD Isolate, these dabs will provide a great enhancement toward your hemp CBD flower. Structure CBD Dabs are the most potent form of vaporizing if using a battery that can use solids. They can also be used toward formulation and cooking if desired. 1000mg of CBD per gram. Available in 6 flavor profiles. Each with different characteristics. CBD (Cannabidiol) is a non-intoxicating component of the cannabis plant known to have a broad range of therapeutic potential. Scientists refer to CBD as a “promiscuous” compound because it confers therapeutic benefits in many different ways while tapping into how we function physiologically and biologically on a deeper level. Extensive pre-clinical research and clinical studies have shown that CBD has strong anti-oxidant, anti-inflammatory, anticonvulsant, anti-depressant, anti-psychotic, anti-tumoral, and neuroprotective qualities. Cannabidiol can alter gene expression and remove beta amyloid plaque, the known hallmark of Alzheimer’s, from brain cells. We believe transparency should be first and foremost when producing any product. All Structure branded formulations are accompanied by a certificate of analysis (COA) validating the testing performed by an independent laboratory. We test all raw materials and products to ensure purity, consistency, and safety prior to release. Structure products are backed by a 100% satisfaction guarantee. Structure, is a group of cannabis and natural health advocates, educated, and dedicated to the plant. We believe in a healthcare based approach for the use of CBD. We select only the purest ingredients and use them in the least amount possible, to produce a pure, potent, and proven product. Our team had decades of experience with the cannabis plant and the processes of manufacturing and distribution. Terpenes are organic compounds that are found throughout the plant kingdom. Terpenes heavily influence a plants scent and may be partly responsible for a plants therapeutic properties. Cannabinoids and Terpenes work in synergy together and both share Biosynthetic pathways. Some researchers believe that these compounds are crucial to the delivery of cannabinoids through the body. At Structure, we consider education as a fundamental principle in everything we do. Whether you’re an industry veteran or just recently getting into the industry we, strive to provide educational guidance based upon aggregated anecdotal evidence supported by customer experiences and interaction. Visit our Education center to learn more about CBD, recieve dosing guidence and more. Our formulations are guaranteed pure. 100% crystalline, CBD-isolate compounded with select botanical-terpenes. Join over 10,000 people who receive bi-weekly CBD news and Structure updates. We are committed to the healthcare and wellbeing of clients. Structure is your one-stop solution for CBD. We work with a wide-variety of companies to develop and launch their own independent-line of CBD products. For over 4 years, Structure has been key in the formulation and launch of leading, hemp-based CBD brands. Structure Health and wellness does not offer medical advice. This website contains general information about diet, health and nutrition. The information provided on this website is not to be construed as advice and should not be treated as such. The general information on this website is provided “as is” without any representation, guarantees or warranties, expressed or implied. Structure Health and wellness makes no representations or warranties in relation to the health information on this website. the information contained on this website is not to be used as an alternative to medical advice from your physician, or your professional healthcare provider. Structure health & wellness products, and CBD products in general have not been approved or tested by the FDA for safety and efficacy. The products manufactured by structure health and wellness, and the products sold on this website are not intended to diagnose, treat, prevent, or cure any disease or ailment.